Movies are a funny business. They are made and presented to critics, and to the public, in good faith. Sometimes the critics love something and the public doesn’t. Sometimes the opposite happens. Sometimes nobody loves a movie. But occasionally, due to bad timing, bad advertising, or other unknowable factors, the critics or the public simply misread or dismiss a movie. At that point, the movie belongs to only a few lonely souls who found something in it that was worthwhile or wonderful. Here are a handful of those kinds of movies, all streaming on Netflix. Terrence Malick’s sixth movie in 40 years was also his first to be received with complete indifference. Like Malick’s universally acclaimed The Tree of Life, To the Wonder (2013) employs a slow, dreamy, drifting quality. However, it’s presented on a much smaller scale, focusing on one man and his relationships with two women, which must have seemed less worthy than the more personal/cosmic themes of The Tree of Life. Nonetheless, To the Wonder gets closer to the emotional truth of a relationship than most normal movies, and the addition of Javier Bardem as a tormented priest brings a fascinating layer, leaving both God and love ultimately ungraspable. Ben Affleck stars in a purposely emotionally clouded role, with the beautiful Olga Kurylenko and Rachel McAdams as the alternating objects of his affection. The Italian filmmaker Michelangelo Antonoini has, like Malick, sometimes met with strong acclaim, and sometimes bafflement. His exemplary feature debut, Story of a Love Affair (1950), doesn’t seem to enjoy the reputation of some of his more famous movies (like L’Avventura and Blow Up). Yet it’s a striking work, showing a master filmmaker fully formed from the start. The story has wealthy factory owner Enrico (Ferdinando Sarmi) hiring a detective to investigate his beautiful young wife, Paola (Lucia Bosé). She reconnects with an old lover, Guido (Massimo Girotti), and they begin to plot an affair—and worse—violence, but soon their passion begins to fade. Antonioni places his lonely figures in forlorn, empty and industrial landscapes, pulling them apart and emphasizing feelings of isolation, ennui, and disconnect. And yet the film still has its moments of crackling passion and secret suspense. Speaking of detectives, the mystery story Twilight (1998), by Academy Award-winning writer and director Robert Benton, also received very little attention when it was released in 1998 (and now it’s overshadowed by a much more famous “Twilight”). Paul Newman stars as a retired detective. He once located the missing daughter of a movie star couple (Gene Hackman and Susan Sarandon) and now lives with them, doing odd jobs. One day, a simple errand inadvertently opens up a twenty-year old murder case. Benton (Kramer vs. Kramer) spins the mystery with cleverness but places a more tender, observant focus on his characters, deftly balancing humor and pathos. The great cast also includes Stockard Channing, James Garner, and a young, fresh Reese Witherspoon. It was co-written by novelist Richard Russo, whose Nobody’s Fool was filmed by Benton four years earlier. Another burnt-out detective, Elliott Gould’s Philip Marlowe came from the pages of Raymond Chandler’s last completed novel, but drastically updated for the 1970s. The mumbling, shambling Marlowe seems lost in a garish world of hippie chicks and potheads and can’t even manage to locate cat food for his demanding cat. In The Long Goodbye (1973), he becomes entangled with a murder mystery and a case of a missing husband, two cases that seem increasingly connected. Ultimately, it’s less about the solution of the mystery than about the crumbling of ideals. Sterling Hayden plays the Hemingway-like husband, and Nina Van Pallandt—who in real life was dating the fake Howard Hughes biographer Clifford Irving—plays his wife. Arnold Schwarzenegger appears in a very early role as a thug. The great Leigh Brackett is credited with the screenplay, and composer John Williams provides a weird score: a collection of alternate versions of the same song. Robert Altman directs all of it with his usual brilliant, rambling, observant style. Here’s yet another underappreciated movie, though this time it’s a slick popcorn movie rather than a demanding work of artistic genius. Adapted from a novel by Michael Crichton (Jurassic Park), Timeline (2003) tells the fairly simple story of a group of archeologists traveling back to the 14th century to rescue a professor; unfortunately, they end up in the middle of a major battle between the French and English. Director Richard Donner’s simple, entertaining style has worked since the days of The Omen, Superman, The Goonies, and Lethal Weapon, and it works again here. The cast, including Paul Walker and Gerard Butler, isn’t exactly memorable, but Donner allows them moments to breathe among the fantasy, focusing more on characters and excitement than on effects. Comedian Billy Connolly and cutie-pie Frances O’Connor also star. Released early in the summer of 2003, The Italian Job (2003)’a remake of a 1969 UK film’was a solid hit, even though it eventually made less money than the year’s more bloated, less intelligent hits. Directed by F. Gary Gray, it’s an old-fashioned heist-revenge movie, wherein something is stolen from the good guys in the first half of the movie, and the good guys spend the second half trying to steal it back. Gray spends a delicious amount of time on the planning stage, giving us just enough details to make the actual robbery all the more exciting. The crew consists of Mark Wahlberg, Charlize Theron, Seth Green, Jason Statham, and Mos Def. Edward Norton is the double-crosser, and Donald Sutherland is the old veteran. With all the horrible romantic comedies in the world, it’s a shame that this good one, Return to Me (2000), isn’t better remembered. Written and directed by actress/comedienne Bonnie Hunt, the movie takes a very shaky premise and turns it into something genuinely sweet and lovable. David Duchovny plays a widower, Bob, whose late wife worked with gorillas at the zoo and donated her heart. A year later, Bob’s friends set him up on a date with Grace (Minnie Driver), who is the recipient of Bob’s wife’s heart! The movie employs the dreaded “lie” plot, wherein Grace doesn’t tell Bob about her surgery for whatever reason, but it all balances out. The amazing supporting cast includes Carroll O’Connor, Robert Loggia, David Alan Grier, Joely Richardson, James Belushi, and Hunt herself. The Chicago and Rome locations add tremendous flavor. Here’s another solution to bad romantic comedies: go to France. American moviegoers will already be familiar with the charismatic stars Jean Reno and Juliette Binoche, and they’re wonderful together in the light-as-air Jet Lag (2002). She plays Rose, a cosmetics expert who is slathered in layers of makeup. Reno plays Felix, a former chef-turned-frozen food magnate. An airline strike strands them both at the Roissy-Charles de Gaulle airport, and fate brings them together when Rose accidentally drops her constantly-bleeping phone down the ladies’ loo and asks to borrow Felix’s. Writer/director Danièle Thompson not only concentrates on getting these two together, but getting them back to basics: Felix back to real food, and Rose back to her natural, fresh-faced look. A reverse-makeover scene, just after Rose emerges from the shower, is breathtaking. It’s hard to imagine a Disney animated movie that goes under-appreciated, but it’s not an entirely uncommon occurrence. After Tarzan became a huge hit in 1999, the goofy, erratic The Emperor’s New Groove (2000) only earned about half as much revenue, and yet it remains one of Disney’s flat-out funniest movies. The wild, angular animation filled with ridiculous one-liners is more reminiscent of Tex Avery or Chuck Jones than any of the Disney classics, which may be what turned off some viewers. David Spade provides the voice of an egotistical emperor who is turned into a donkey by a witch (voiced by none other than Eartha Kitt). John Goodman is the poor, but kindly villager who helps him out. Patrick Warburton is absolutely hilarious as the witch’s dim sidekick Kronk. 2012 was an amazing year for animated features, so it’s only natural that some of them were buried under the abundance of riches. 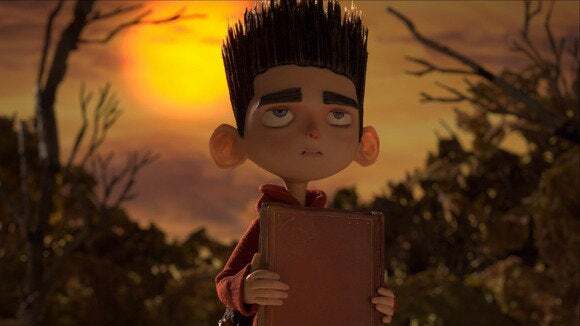 With its ever-so-slightly melancholy tone and its matter-of-fact glimpses of death, Chris Butler and Sam Fell’s magnificent ParaNorman (2012) was the obvious candidate to be overlooked. It’s about a boy who can see and speak to dead people. He discovers that he’s in charge of a ritual designed to keep a witch and a hoard of zombies at bay, but when he bungles it, the town comes under attack. ParaNorman has its share of big laughs and adventurous thrills, but it never shies away from darkness, either. The wonderfully fluid stop-motion animation gives it an organic texture that makes it feel all that much spookier.